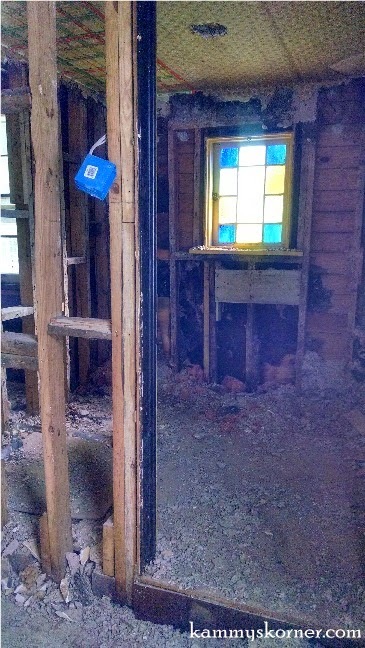 But when the insurance agent said the old stained glass window in the bathroom had to be replaced and my mom said that I just had to find a spot for it, I'll admit I was a bit hesitant. No way was was I going to toss it (I'm part hoarder after all) ... but the yellow was just so..... yellow. I'm sure this bathroom with it's window was a trophy back in the day with the shutters and yellow painted trim. And isn't that wallpaper something? I wish I would have kept a swatch of it! It was rather cute in it's own little vintage way! In my opinion, everything can be fixed with some paint. But in Hubby's opinion, not so much. What? We need to have heat ducts going to the bathroom? Outlets that actually work? That marble surround tub won't get you as clean as a new fiberglass one? Picky, picky! So my mother, the staging queen, decided the perfect place for my window was on the piano. I whole heartedly agree! Mom, you the bomb. As usual.